STRUCTURAL soundness, a term commonly used to describe the conformation of an animal (e.g. feet, legs, udders), is an important trait in beef herds, with animals needing to conform to certain structural requirements to ensure high levels of mobility, production and adaptability to the environment. Importantly, structural soundness is heritable and can be improved in both the short and long term by selection. There are also no known antagonistic genetic relationships between structural soundness and other traits of importance, enabling structural soundness to be improved genetically without impacting negatively on other traits. While it is common practice to informally observe animals and assess their structural soundness, animals can be more formally assessed using the Beef Class Structural Assessment System. The Beef Class Structural Assessment System uses a standardised scoring system for traits such as feet and leg structure, udder evenness and attachment, teat size and shape, capacity, sheath and naval attachment, and muscle score. For capacity, sheath and udder attachment, a 1-5 scoring system is used, with a score of 5 being considered ideal. The five Structural Soundness EBVs are expressed as differences in the percentage of progeny that will have desirable structure for each respective trait, with higher EBVs indicating a greater number of progeny with desirable structure. For example, a bull with a Front Feet Angle EBV of +20 would be expected to, on average, produce 15pc more progeny with desirable front feet angle than a bull with a Front Feet Angle EBV of -10, all other things being equal. Like all production traits of economic importance, the structural soundness of an animal is a combination of the genetics inherited from the sire and dam, and a range of non-genetic factors. This may include such things as the nature of the country in which the animal has been running, or historically, whether practices such as hoof trimming have been undertaken. 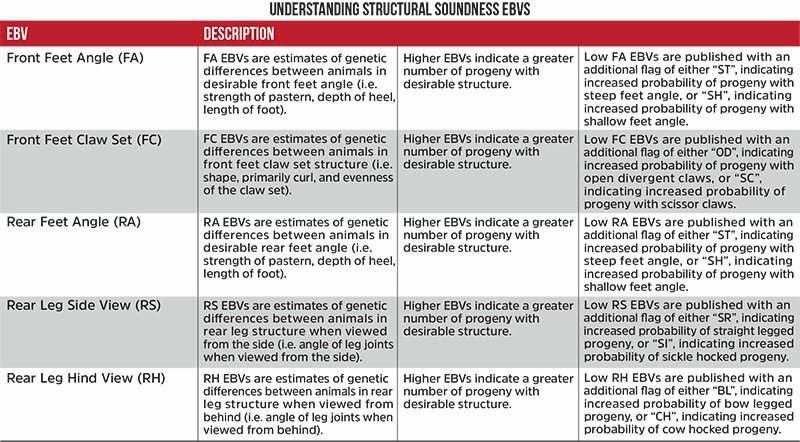 Structural Soundness EBVs account for any differences in non-genetic factors to provide an estimate of an animal’s genetics for each respective structural soundness trait. EBVs for structural soundness take into consideration not only the structural soundness of the individual animal, but also the structural soundness of all the animal’s relatives. In this manner, the EBVs provide a better indication of an animal’s genetics for structural soundness than an assessment of the animal’s structural soundness alone. EBVs allow for genetic differences in structural soundness to be identified between animals who themselves may have acceptable structure (see table 2). Animals who may have acceptable structure but are likely to produce a high percentage of progeny with poor structural soundness can be removed from the breeding herd, or conversely, if two animals of similar genetic merit for other traits are being considered for use within a breeding program, the animal that is likely to produce a higher percentage of progeny with desirable structural soundness can be selected. This is particularly beneficial given some differences in the structural soundness of animals may not become evident until the animal is older, and well after selection decisions have been made. With tools such as the Beef Class Structural Assessment System and Angus BreedPlan Structural Soundness EBVs available, beef producers have the ability to select for improve structural soundness in their beef herd by utilising a range of different selection strategies. All animals in a beef breeding program should be assessed for structural soundness, using either the Beef Class Structural Assessment System or a less formal method, and any animals with unacceptable structure culled from the breeding herd. For females, the risk of lower performance due to the presence of structurally unsound females in the breeding herd is reduced. Culling animals with unacceptable structural soundness does also ensure that the genetics of any animals with unacceptable structure won’t be passed into the next generation, albeit with the knowledge that Structural Soundness EBVs provide a better indication of an animal’s breeding value than the animal’s own structural soundness. Structural Soundness EBVs should be utilised when selecting animals by way of improving the structural soundness of the “future” breeding herd (i.e. the next generation). Selecting animals that have superior Structural Soundness EBVs (or avoiding animals with inferior Structural Soundness EBVs) is paramount to genetically improving structural traits in a beef breeding enterprise. As with selection for any trait, genetic improvement for structural soundness will be achieved if the animals selected for breeding this year are genetically superior to those used in previous years. This is particularly important when selecting sires due to the overall influence of their genetics in a herd both in the short term and long term. While structural soundness is important in a beef enterprise, similarly to selection for other traits, selection for improved structural soundness should be balanced with selection for other economically important traits. When making selection decisions, appropriate emphasis should be given to each trait based on the relative economic importance of the trait to the individual beef enterprise. The overall objective of any selection program should be to maximise enterprise profitability, rather than focussing on improvement of an individual trait of interest. In December, five new Structural Soundness EBVs were included in the routine Angus BreedPlan genetic evaluation. The Structural Soundness EBVs published within Angus BreedPlan are calculated from subjective structural soundness scores that have been collected by an accredited scorer when animals are younger than 750 days. 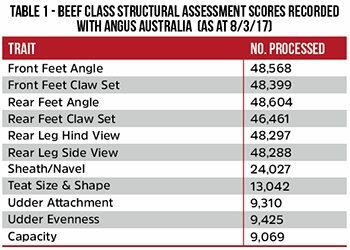 Structural soundness scores for Angus BreedPlan are collected using the Beef Class Structural Assessment System. 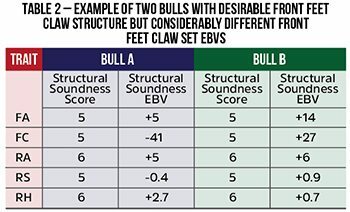 While bulls are most commonly scored, structural soundness scores can be collected on both heifers and bulls. It is important to try and score as many animals within each contemporary group as possible. Collection of structural soundness scores for only a selection of animals (e.g. only collecting scores for sale bulls rather than the entire bull drop) may result in data biases and the subsequent calculation of Structural Soundness EBVs that do not reflect the true genetic merit of animals. There needs to be some variation in scores for them to be used in the Angus BreedPlan analysis. Scoring all animals in a group with a structural soundness score of  does not identify any differences in structure between animals, and consequently does not provide any useful information for the calculation of Structural Soundness EBVs. The valuable message in this article is the example of two animals with equivalent structural scores, but with differing structural EBVs, indicating one will have progeny with more desirable structure than the other. As a selection tool, EBVs are sharper than selection on phenotype alone.